Autographed copy of "Run Like a Mother"
1- Answer the Question: How you or a Mom you know flex Mommy muscles or Run Like a Mother. Leave a comment. 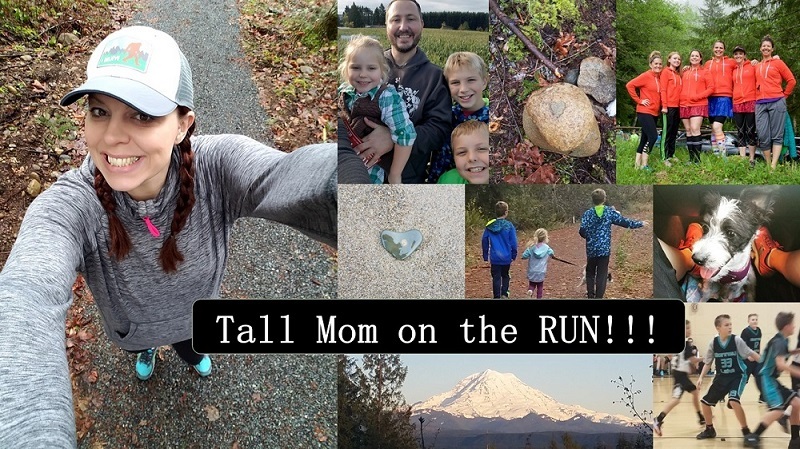 3- Go to the Run Like a Mother Book website HERE and leave them a comment to let them know Tall Mom sent you to wish them a HAPPY MOTHERS day. Leave me a comment to take credit. BONUS there is an article about soon-to-be running mom Kara Goucher, Sarah wrote the article, how awesome is that?? 4- Share this Giveaway via blog, twitter, facebook, or tell and friend. Leave a comment. Giveaway ends and WINNER will be announced on High Five Friday May 14th. My friend flexes her (sah)mommy muscles by having 4 kids AND being knocked up again, all the while still managing to get a work out in on most days! My tip: Don't feel guilty about making running a priority. I know my kids are better off having a happy productive mom. Left comment on book site! added to my sidebar also. I am not a Mom yet myself but I do have a pretty amazing Mom. She is always there for me when I need her (i.e. carting me to work and back when I sprained my ankle) and helps out whenever she can. I am grateful to live so close to her :). That's your mom???? WOW!! She looks awesome!!!!! I am so fortunate to live in a neighborhood with a group of wonderful running mothers! We all run like a mother by squeezing in our runs whenever we can find the time! Some get up before the sunrises to get out on the trail, others catch a quick run before the kids get home from school, between loads of laundry. Some of us hit the trail in the evening after hubbies have come home from work. I flex my mom muscles by keeping our schedules together and getting everyone where we need to go! Including myself out for my runs. I fit running into my busy life by not making excuses for why I can't go. With a jogger to put kids in and a treadmill in the garage I have absolutely NO excuse not to go running. My mom does a lot for me and my siblings. My sister works third shift and my mom works 2nd shift but she will wake up early and drive 30 minutes to my sisters house to watch her children so my sister can sleep for a few hours before my mom has to go to work. With my husband gone a lot, I depend on my double stroller. It is helpful for me to have a calendar to keep track on my workouts for the day. I flex my mommy muscles by staying home with my 4 boys and still managing to have my own interests. I also have a friend who is raising 5 kiddos and manages to run regularly. We ran a 5k together recently and could not have done it without each other! I went to RLAM's site and said you sent me there and wished them a happy mothers day! I posted this giveaway to my blog's sidebar! as much as I hate to admit it, getting up early in the morning to run is the truly and awesome thing. Its hard to get out of the warm toasty bed to go sweat for an hour or so but my days are so much better started with a run! My running buddies and I (all mommies) flex our mommy muscles by running every Friday morning at 5:00am. My new way to fit in my strength training is to go the gym when my girls are at ballet. I told Sarah and Dimity Happy Mother's day for you! I left a Mother's Day wish for the RLAM ladies! I flex my running muscles by staying home with my 4 kids, working in soccer practices and playgroups and supporting my husband in law school. My tip: if you can't get up early to run before the day starts (which I highly recommend) use a stroller and take your kids with you... run to parks and while your kids play do sprints in the grass, or use the stroller on errands, like to the post office or grocery shopping or even the library. I left a comment on the Run Like a Mother website. I read the article in the Times, its a good one! Linked you up on my sidebar! My tip would be to get it done early. The shooner you get it done the less you have to worry about it. I linked ya on my blog! HAPPY MOTHER'S DAY!!!! Thanks, Tall Grandma for hosting a book giveaway: that is SO sweet. A belated congrats on nabbing Boston, Mel--and good luck with the new house. You're amazing! xo. I wished the ladies at Run Like a Mother Happy Mother's Day, and same to you as well! i'm not a mother but i know my mom flexed her muscles by not only having 6 kids but having each one without epidurals! I flex my mom muscles by sneaking home for lunch as much/often as I can to have lunch with my girls. Also they come for long walks with me every day to help "grow our muscles"
My only tip has been to leave work a bit early and go to the gym before coming home so then I can spend the rest of the evening w/ my family. I also hear that a lot of people get up and exercise very early, but I'm not a morning person. I flex my mommy muscles by doing as many of my running workouts as possible while the kids are at school. This leaves me in a great mood and with more time to play and run around with them when they are home. My tip is to start each week by figuring out your workout goals and then scheduling them on the family calendar. There are a lot less missed workouts if you schedule them around your husband's late night at work or your day to volunteer in the classroom. I try to mentally prepare the night before thinking about my work out or run. I think about my songs and the feel of the outdoors. Also putting my clothes out is a must! Left a comment on Run Like A Mother! Thanks Tall Grandma! I flex my mommy muscles by making sure that my son is able to see the family exercising/working out on a regular basis. I'm hoping that it will encourage him to have an active lifestyle. I fit it in by making sure that my husband is on board with the plan and scheduling the time to go. Naps, before the kids wake up, during my husband's lunch break, after work - we have started going together now with the time change - but I make him push the jogging stroller! Yesterday my mom walked in the 5k that I ran. She usually doesnt run but for the final 0.1 she ran and even beat some other runners! For fitting in running, you have to take the time. You make the time to do the laundry, and make dinner etc etc so you have to make the time to run. I love doing it in the morning because that usually guarantees i get it done. My mom always used to run/walk in the mornings before I woke up so that she made sure she got her exercise in! I flex my Mommy muscles by caring for my son, husband and dog but also for myself. Since having my son, I am in the best shape of my life. #2. I make a schedule of my workouts at the beginning of the week and it makes it easier for me. #4. I told my friend Alecia about the giveaway. I flex my Mommy muscles everyday! I work my life around my little boy! In the mornings my husband goes into work super early, so I do everything in the mornings myself. I get up around 4:45am to make sure I have enough time to get ready before my little man wakes up. If he wakes up early, then it is entertain time, while trying to get ready. I then get him ready, fed and out the door no later than 7:20am. In the evenings, my husband is there, but I do most of the leg work, especially if I want to make it to the gym that night. I rush home from work to make dinner for my little guy, and big guy, get dressed for the gym, lay out little man's pj's and give big hugs and kisses as I grab a banana or sometime to eat on the way to the gym. Dinner comes when I get home around 8pm. That is my time to relax and watch my DVRed shows. Life is crazy, but I wouldnt change it for the world. I love being a mommy! My tip is to plan, plan, prepare, prepare, and plan some more. I try to be as organized (mentally at least) so that I can make sure I have everything ready to go to make sure I can get to the gym, or out for a run. As long as I can anticipate things, I am good! I left a comment on their site! Thanks for the giveaway! I flex my mommy muscles by showing my little girls that moms can do everything. The best time to workout is first thing in the morning when everyone else is asleep. That time becomes precious to you because the only sounds are your feet hitting the pavement or treadmill. It is also a wonderful time for the family because you are doing what you love to do , and it is not taking time away from them. I fit running into my schedule by running on my lunch breaks as well as a long run on the weekends. 17 miles on Mother's Day - YEA! My blog is riddled with posts of times I've failed to get in a run due to the busyness of life. So rather than offer a tip of HOW to get a run/workout in, I'm just going to say that if you DONT, I think the key is to forgive yourself. We have enough stress as moms, we have a lot of "mommy guilt." We shouldn't add more guilt when we dont get a run. Tomorrow is a new day. Done. And I seriously wasted some time on the site. Thanks Mel! Posted the giveaway on my FB page. I hope it inspires others! You have to do it when you can do it. If you only have 30 minutes then do it! I only have small windows of time to run so I have to make it happen or it will never happen. I "Run Like a Mother" So my kids will Run Like a Dad some day....I want them to be healthy and I hope by watching me they will chose to do something healthy for themselves as they get older. I want to inspire them to do something great. Left a comment on there site. I flex my Mommy muscles by making running a priority and setting an example of the importance of taking care of myself to my girls. There is no secret to finding the time to fit running/fitness into your life. It comes down to something everyone has heard before: you have to make it a priority and make it happen. 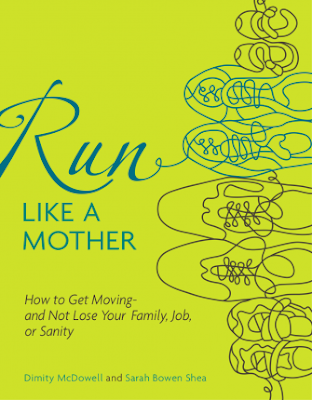 I Run like a Mother b/c when you are pregnant it's really unavoidable. :P lol Honestly though-As a mom of 7 (and 2/3) kids I'm flexing Mommy muscles all day long-keeping everyone on task and on schedule and making sure that they know that they are my first priority, but that my health and well being is also a priority. One of my goals is helping them know that being healthy and fit is fun and feels great! My favorite tip for fitting it all in is be flexible!! Sneak it in when you can. Don't be so set on your "training/workout schedule" that you are willing to lose a day if you don't get your run in when you planned. If one of the kids is up all night, maybe that 6am run won't work, so work it into your schedule later in the day. If you can't dedicate the solid block of time to a long run, break it up! Do half of it in the morning before the kiddos wake up, and the other half in the evening after they go to bed. Squeeze the miles in where you can. It also helps to find another crazy runner mom close to home who understands when you call and say "can my kids come play for an hour? I really need to run!" The other runner moms are the ones who understand, and they appreciate having someone who will do the same for them! I flex my mommy muscles by running as often as I can, taking walks with my sweet daughter and riding my bike. My tip for fitting it in, is to just do it. For me that means running at lunch and then eating at my desk at work. Not ideal, but it's the only time I have so I make it work. On the weekends, it means forgoing sleeping in and waking up early to run. It's not a perfect system and sometimes I miss runs, but I do my best and I feel great because of it. I run like a mother by raising four, homeschooling three and running for my sanity. 2) Schedule workouts and make them a priority. I read that article over the weekend and that is how I found all both your blog and the blog you linked us too. 4) I shared your giveaway with my best friend. 2........TIPS FOR FITTING RUNNING IN! You have to make running a priority, and fit is in when it would be least disrespectful to your family. Therefore, most runs are done early in the a.m., and if If i do NOT GET THOSE IN-i run around track while the kids are at soccer. they is Always a way to sneak a little running in.